Books by Patricia Puddle: Introducing author: Farida Mestek. Hi, Farida, how long have you been writing and have you always wanted to be a writer? I honestly can't remember the time when I wasn't writing. It is something that I have to do in order to be happy. As a child I wrote poems, as a teenager – songs, as a young adult – fanfics, and now I'm writing books. And when in the past I couldn't think of anything to write, I kept journals. I always thought that it would be great to be a writer and I told my family that that's what I would become. Tell me, do you remember your first writing attempts? What genres have you been writing in? What other genres would you like to pursue? So far I've written three Regency-set books, one fantasy story and a number of fairy-tales. I think I'd love to write a detective story one day. I love detectives! I'd also like to try writing screenplays for movies or – better still! – TV shows. I grew up watching lots of those and I always wanted to work in the genre. What are the main themes of your latest book? What was it inspired by? Farida, that is really amazing that we have just met. Wow! You've had chemotherapy? I wrote and published a story about an eight-year-old girl who also lost all her hair from alopecia. My book, Velvet Ball and the Broken Fairy is also a story of loneliness, fear and humour and was aimed to show the problems that children with alopecia have. I'm so delighted to meet a real Velvet. You're an inspiration. I'm sure children and adults with this problem will love your story. Okay, back to your book. What goals do you set out to achieve when you start writing a new book? Sometimes I simply want to tell the story. I have this need to share it with other people, because writing is such a personal and isolated activity. At other times, I want to try and write about an important issue. Ultimately, I want to write a story and characters that readers would like to come back to. I'm not sure I have accomplished that with any of my previous books, but I hope I will one day. Are you a fast or a slow writer? How long does it take you to write a book? I'm a very slow writer and it takes me about a year to write a book. I'm quick at outlining the plot – in my head – and not so quick at writing it down, so that I often have to stop myself from thinking about the story in case I forget something crucial. I do write it down eventually, but it takes me a long while. And then, as I've recently discovered – I am dependent on my muse and when she's out of town, I can't seem to write anything at all. Do you ever base physical appearance of your characters on people you know, portraits or actors? Any examples or images that you'd like to share? I often see my characters as people from real life. In fact, seeing them and their most outstanding features in my mind's eye makes it easier for me to describe them in writing. 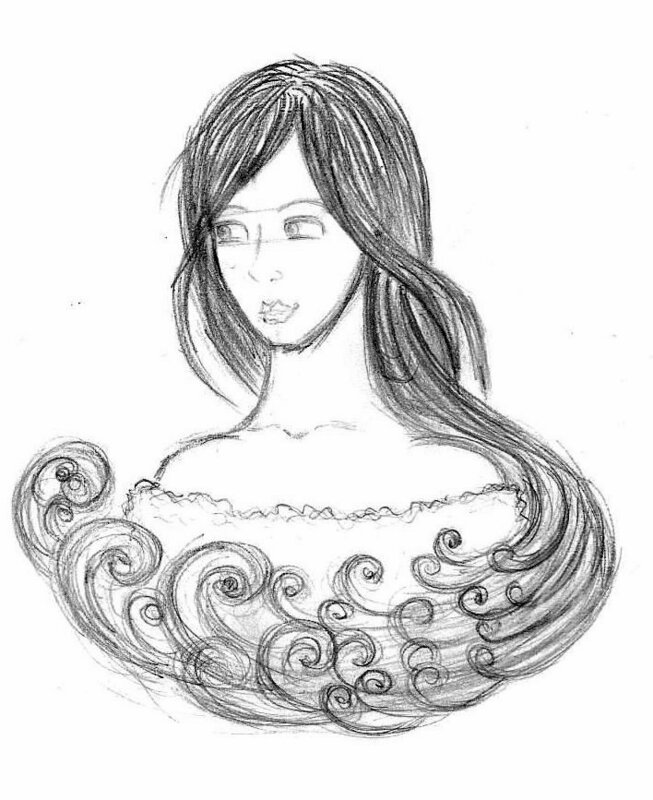 I also love sketching my characters and, because I'm not very good at drawing, they don't always end up as I would like them to. At times, however, I hit the mark. 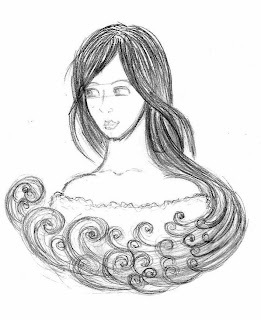 For example, this is one of many sketches of Almendra that I made and I can say that I'm really happy with it. Introduce the main characters from your latest book. Who are they? Let them speak for themselves. What would they like to say? My name is Jonnah Nibbler-Pincher. I'm a singer and a traveller. I've been travelling for years now. One day, as I was sitting on the bank of a river, singing a song and playing a tambourine, I encountered Almendra – the nowadays High Lady of The Upper Kingdom. It turned out that she was going to The Land of Men to try and find love in order to get rid of the curse of unhappiness, loneliness and gloom placed upon The Upper Kingdom by her mother many years ago. But she didn't know where she was going – she has never even seen a man in her entire life! – and, as I have long since wanted to supply my aimless wanderings with a purpose, I offered myself as her guide. We very soon became very good friends and she turned out to be not at all what I expected. Of course, she has a bit of a temper and she can be rude and stubborn, but she is also very naïve and is willing to learn. Well, I'm afraid that she had to learn quite a few lessons on her quest and pay a terrible price. This journey to The Land of Men – a vile land if there ever was one – changed her forever and so it fell upon me today to introduce us both. Almendra, the High Lady of The Upper Kingdom, is doomed. Many years ago, in a fit of rage and broken heart, her mother banished all the men from the country and plunged it into unhappiness, loneliness and gloom. For many years Almendra’s only companions were her old Nanny and her faithful friend Woo, the wolf. 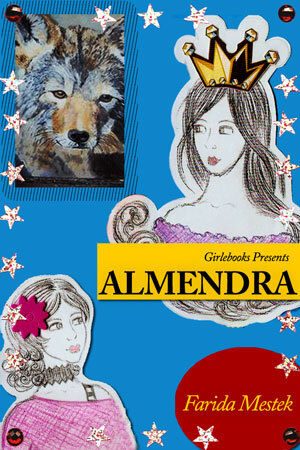 Now Almendra faces a daunting task of going to The Land of Men and getting rid of the curse. But she doesn’t know the way and she has never seen a man in her life. In comes Joannah Nibbler-Pincher, a girl with a tambourine, a bag of sad songs and a thick black choker that hides the mystery of her painful past. She and Almendra become best friends and Joannah takes it upon herself to take the High Lady and her unconventional family to The Land of Men, where Almendra intends to find love that, according to a fate line left by her mother, will have the power to restore The Upper Kingdom to all its former glory. But it’s a long way to The Land of Men and the outcome of the journey will change Almendra forever. Thank you, Farida. That was wonderful and I really admire you for writting this book, considering your health issues. Maybe with our stories we can bring some happiness to readers suffering alopecia and cancer. Labels: Introducing author: Fareda Mestek. Thank you for letting me interview you on my blog, Farida. I'm so lucky to have met you. And I love your sketches. They are fabulous. Good luck with your books, Farida. I hope your hair grows back, thick and long, but if it doesn't, you'll be just as beautiful because you have a beautiful face and mind. Thank you very much! I'm glad to meet you too! very good interview, Thanks for sharing your pluck, insights and work with us Farida. Your book sounds great! Your sketch is wonderful! Thank you for visiting my blog, shaeeza. I hope you come back again. You're welcome, Farida. I loved adding your work. Good luck.